England's white chalk cliffs are iconic. But don't expect to see them at Dover. The best views are further along the coast. According to the Oxford English Dictionary, an icon is a person or thing regarded as a representative symbol of something. By that definition, the chalk cliffs of England's Sussex coast - the Seven Sisters and Beachy Head - are as iconic of England as Big Ben, Tower Bridge and the Queen. The Green Cliffs of Dover? You've probably seen pictures of the Seven Sisters' undulating run of gleaming white cliffs on post cards and in guidebooks, on calendars, in tourist brochures, and on websites - without actually knowing their name. The White Cliffs of Dover, celebrated in a famous WWII song of the same name (have a listen), may be a more famous name to reckon with but they aren't really white anymore. Erosion protection to secure the Port of Dover and the entrance to the Channel Tunnel, are gradually turning them green. But the impact of winds and tides scours away at the faces of the Seven Sisters and Beachy Head, exposing the chalk and keeping the cliffs (to steal a phrase from Victorian poet Matthew Arnold) glimmering and vast. That's why today they regularly stand in for the White Cliffs of Dover in films and television. To see the Seven Sisters and the Beachy Head cliffs for yourself, you have to travel to the perfect vantage points. Luckily, these are not hard to reach if you know where to look. They are within a short distance of both Brighton and Eastbourne, less than two hours from London, easy to approach by car and public transportation and, for some viewpoints, wheelchair accessible as well. From the National Trust property at Birling Gap you can see the Seven Sisters looking west from just beyond the easternmost cliff, Went Hill Brow (the view pictured here). It's probably the easiest viewpoint to reach with inexpensive parking, good facilities for families and disabled visitors, and access to both the beach and stretches of the South Downs Way. It's about five miles from Seaford and six miles from Eastbourne. By car - look for signs from the A259 around East Dean. Park in the National Trust pay-and-display parking lot (free for members). By public transportation - the Sundays-only 13X bus between Eastbourne and Brighton stops at Birling Gap. Otherwise, most of the bus services between Seaford or Brighton and Eastbourne stop on the A259 at East Dean or Friston, near signposts for Birling Gap. It's a walk of about a mile and a quarter. See on a map and don't forget to click on the map page to enlarge it. Check the Brighton and Hove Bus Company website for up-to-date fares and prices. The National Trust maintains a new café (indoor and outdoor tables), a shop and a toilet block on the cliff-tops at Birling Gap. There is also a large viewing platform (wheelchair accessible and suitable for children) for very good views of the Seven Sisters. You can join the South Downs Way, national footpath, signposted from the parking lot, or descend the sturdy, cage-enclosed stairs to the beach to hunt for fossils in the chalk falls. Just be careful to keep an eye on the tides and the cliff faces. It's not uncommon for small pieces of chalk to break off and tumble down to the beach. From Seaford Head, looking east across the River Cuckmere, the cliffs and their green carpeted hills roll away from Haven Brow ( the first and, at 253 feet, the tallest of the Seven Sisters ) to Went Hill Brow, the last of the group. Several Coast Guard cottages on the Seaford side of the river valley balance the familiar composition, creating the perfect image for photographers and painters, professional and amateur alike. 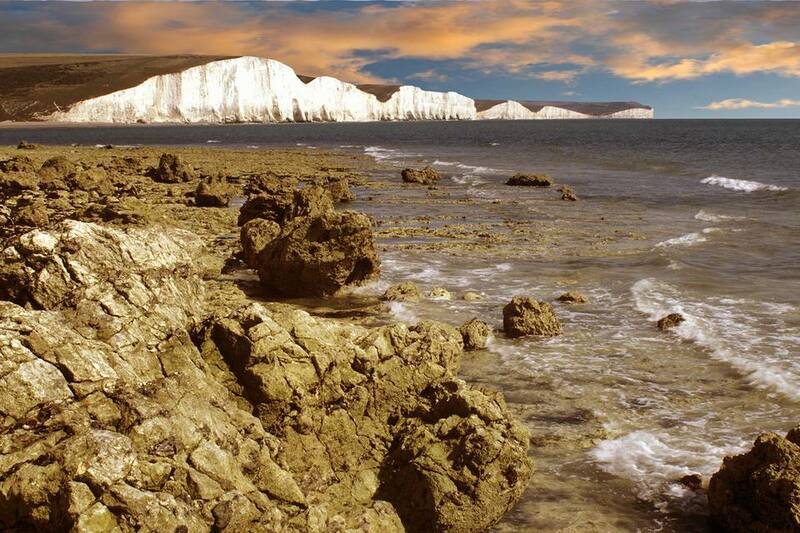 Seven Sisters Country Park, nearly 700 acres of chalk cliffs and chalk downs within the South Downs National Park, is off the A259 at Exceat between Eastbourne and Seaford. Public buses from both Seaford and Eastbourne stop at the park visitor center. The most direct approach for travelers from London is by train from Victoria to Eastbourne or Seaford (Check National Rail Enquiries for times and fares), then local bus. See the Seven Sisters Country Park website for up-to-date local bus information. The viewpoint is about three miles from the visitor center where pay parking is available. Alternatively, you could plan on lunch or drinks at the Cuckmere Inn (formerly the Golden Galleon) in Seaford and then use their parking area to cut your walking distance in half. Bear in mind, though, that their parking is only for their patrons and you could be ticketed or towed if you're not also visiting the pub. On foot, from the park center, walk westward along the A259 towards Seaford. Stay on the footpath on the left, as this can be a busy road. Take the path along the river, from the far end of the parking lot, to the beach at the mouth of the Cuckmere, about a mile and a quarter. Turn right along the beach and climb past the Coast Guard cottages. Then turn and look back at the best vantage point for the classic view, looking east. See on a map and once the map page opens, you'll have to click to enlarge it for a good view of the route. Beachy Head, at 531-feet, is the highest sea cliff in Britain. It's possible to see it from the beach below but difficult to reach that way and time limited because of tides that rise quickly to a depth of seven feet or more. By the far the best way to see the chalk faces of this dramatic spot, dwarfing the famous red and white striped Beachy Head lighthouse below them, is from a boat on the English Channel. Sussex Voyages run hour-long guided tours from Sovereign Harbour in Eastbourne between the beginning of March to the end of October, weather permitting. The trip is in a ten-meter long, rigid-hulled inflatable boat that is similar (though bigger) than the boats used by Britain's lifeboat men. Adult fare (in 2019) is £25, children 4 to 16 years old cost £14 and infants to three years cost £5. There are also a range of family package combinations and, if you have a group of up to 12 people, you can charter the whole boat for £280. Visit their website for up-to-date schedules and prices plus pictures of their boat.